Is Syria secretly supporting Gaddafi? and I discovered that a ship had indeed sailed from Tartus to Tripoli. The viewer claims that he saw many plain-clothed security men were aboard the ship, and that the ship’s crews demanded bribes to allow the stranded families safe passage back to Syria. Last Wednesday [2nd March] UK authorities had observed Syrian mukhabarat officers arriving at Abdulsalam Jallud’s villa in the Libyan capital … It is believed that the “delegation” belonged to the external branch of the Syrian General Intelligence – or more likely – to the Air Force Intelligence. Abdulsalam Jallud was considered to be the number two man in Libya until he fell out with Gaddafi in 1993. It is believed that he was involved in many acts of terrorism including Lockerbie, which were perpetrated with the active knowledge and support of the Syrians via the Abu Nidal Group and the PFLP-GC. Nayuf says that it is documents relating to these acts which are in the Libyan intelligence archives that the Syrian officers wish to destroy. 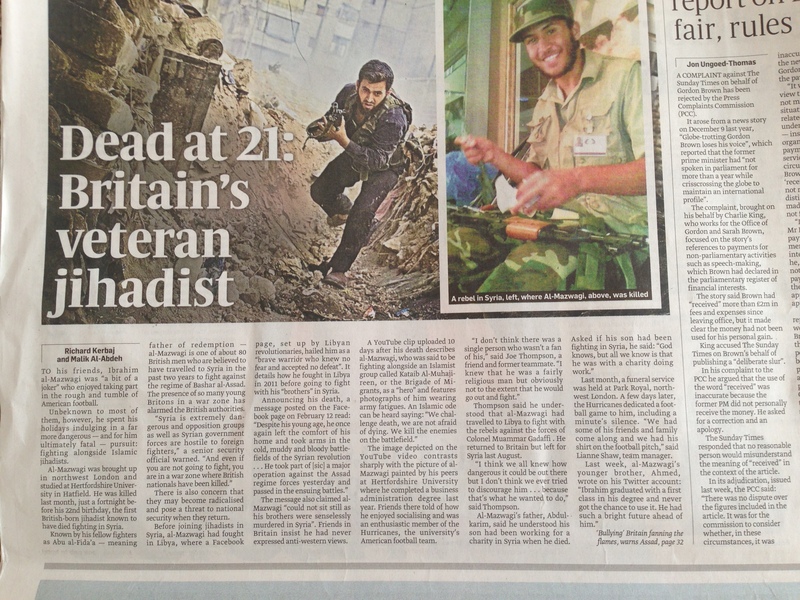 The story could be true, but I am deeply sceptical of Nayuf’s unnamed former MI6 source. 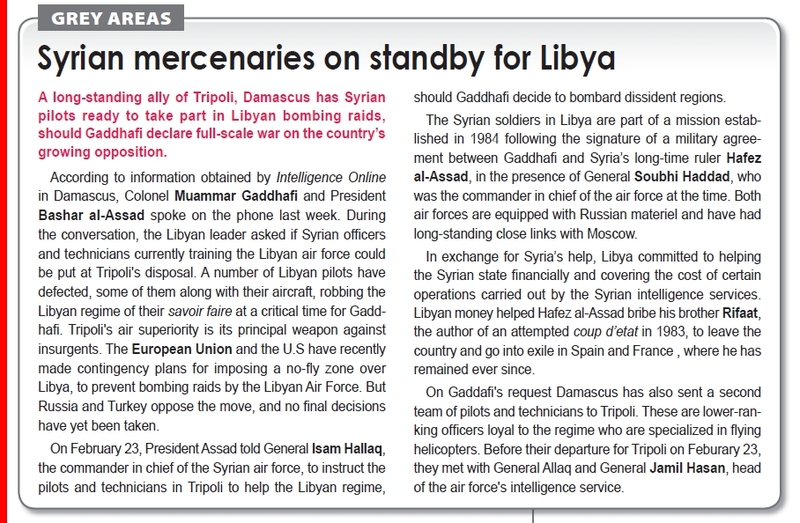 A more credible report appeared in the 3 March edition of Intelligence Online (below), which says that Syrian pilots based in Libya have taken part in bombing raids against the protesters with the consent of Bashar Al-Assad himself. President Assad told General Isaam Hallaq, the commander in chief of the Syrian air force, to instruct the pilots and technicians in Tripoli to help the Libyan regime should Gaddafi decide to bombard dissident regions. A long-standing defence agreement between the two countries has meant that a number of Syrian pilots are stationed in Libya to train with the Libyan air force. Intriguing.. and quite possibly true. What gives this story a large degree of credability was the shooting down yesterday of a Libyan air force jet by rebels, killing both pilots. After checking their ID papers, the rebels discovered that one of the dead pilots was a Syrian. A cameraman working for France 2 captured the moment. Watch the video here. It is of course saddening to hear of Syrians participating in attempts to crush the Libyan revolution. Unfortunately, it is does not surprise me in the least. Not only is the Libyan dictator one of Syria’s closest Arab allies, his downfall may encourage Syrians to rise up against their own regime. Reason enough then to make sure he survives. A few days ago, the above video surfaced on YouTube of Seif al-Islam Al-Gaddafi atop an armoured vehicle in what appears to be a morale-boosting visit to the front line. What is interesting is that Seif is carrying a German-made H&K G36 assault rifle, not the standard issue AK-47 used by the ordinary troops. His jacket is most probably designer and so too are his glasses. This is the story of the LSE graduate, who counted Peter Mandelson as one of his close friends, now finding himself having to crush a popular uprising on behalf of dictator dad. You might think he’s grossly out of place. Very briefly, you might even be tempted to feel sorry for him. For Arab dictator dynasties however, this is just another day in the office. This leads me onto Bashar. I was never sold by the portrayal of him as a gentle, caring, softly-spoken reformer and modernizer. I felt there was something phony about him because had he been the gentle, caring, softly-spoken reformer and modernizer, he wouldn’t have lasted as long as he did. It’s funny how Bashar has much more in common with Seif than he would otherwise like to admit. Both are sons of “revolutionary” dictators, both are stupendously rich, both studied in the UK, both have had military training, both had been assigned portfolios that would endow them with popularity (anti-corruption drive for Bashar, charitable organization for Seif), and both were groomed from an early stage to assume power at a future date. But more importantly, both have demonstrated that underneath the thin veneer of civility and Western education is a vicious and vindictive character, every bit as nasty as daddy’s. It took the Libyan uprising for Seif’s true colours to show. Bashar on the other hand has been showing his true colours to the Syrian people for the last eleven years. His latest victim is Tal Al-Mallohi, the 19-year old blogger arrested and recently convicted in a secret trial on trumped-up charges of spying for the CIA. I shudder to think what she has gone through in those cold and damp underground dungeons. Then there was the Seidnaya Prison massacre of 2008 and the Qamishli massacre of Kurdish protesters of 2004. And let’s not forget the murder of Sheikh Ma’shuq Al-Khaznawi in 2005. That’s not to mention the many killings carried out in Lebanon which implicate Bashar Al-Assad personally. I suppose the only obvious difference between the two is that Bashar made it to the top and Seif is unlikely to do so. Bloody good luck for the Libyans. Not so good for the Syrians. Like millions across the Arab world, I watched Saif Al-Gaddafi’s TV address. I wasn’t surprised at what I heard. 1- We are the guarantors of the unity of the country. If we go the country will fall apart. 2- We are the guarantors against Islamic extremism. If we go the Islamists will take over. 3- We are the only ones qualified to run the country. If we go, public services will collapse and the economy will suffer. The use of these arguments reflects an absolute moral bankruptcy at the heart of the “monarchical republics.” In order to justify their existence, they refer not to what they have actually achieved, because they have achieved very little, but by what may happen if they are removed. It’s a cheap way of playing to people’s worst fear. This same argument is being deployed aggressively, and with slightly greater skill, by Bashar Al-Assad and his propagandists at home and abroad to stave off a popular revolt and/or international isolation. The only problem is that in both Tunisia and Egypt where regimes where brought down, there hasn’t been the predicted lawlessness or national disintegration. People can see that there is life after these regimes. The victory of the Libyan people against their oppressor of 42 years will be a final nail in the coffin to these “lowest common denominator” arguments. It won’t off course stop people using them, but they are becoming extremely tenuous and increasingly ineffective.